So with loads of motivation for 2012, I managed to make an ascent of my fifth 9a, fabela pa la enmienda. This one is special to me as it climbs all the way out of the cave at Santa Linya. 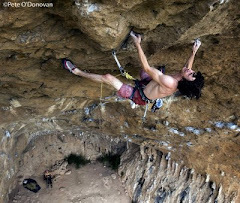 I remember first visiting the cave on a trip when I was 17 and swinging around on the 8a´s there thinking how impossible and intimidating the place was. Ít´s cool to look back and be able to see the improvement, something that is often very hard to see and something that as climbers we are always looking for. Thanks need to go out to Lynne for the epic belays and to EDELRID, whose support is much appreciated. Gerard hanging out at the rest on fabelita 8c. Well Catalonia is the place to be in winter. Cold, crisp, blue sky days are what it's all about. Xmas and new year have come and gone but the winter season out here is still in full swing. The psyche is high and all that christmas grub seems to have finally been burnt off! This year I am psyched to do more exploring, get out and try some hard routes in new places, bolt more and climb more onsight! Maybe even a multipitch or two!